Enter your email address to follow this blog and receive notifications of new Craft and DIY content by email. 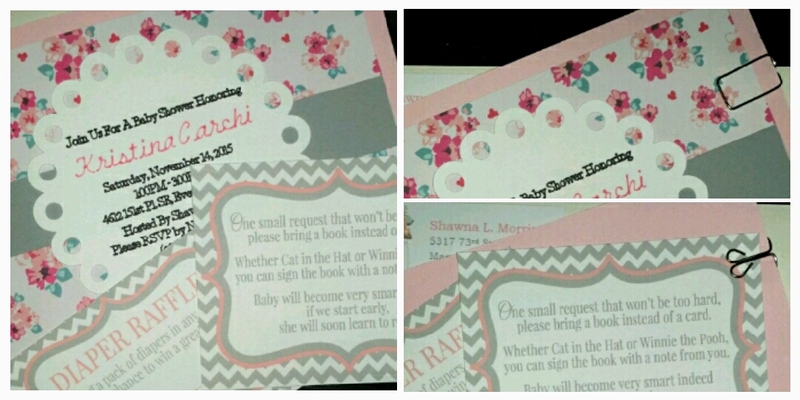 I had a lot of fun designing and creating the Baby Shower invitations for my friend’s Baby Shower in November. 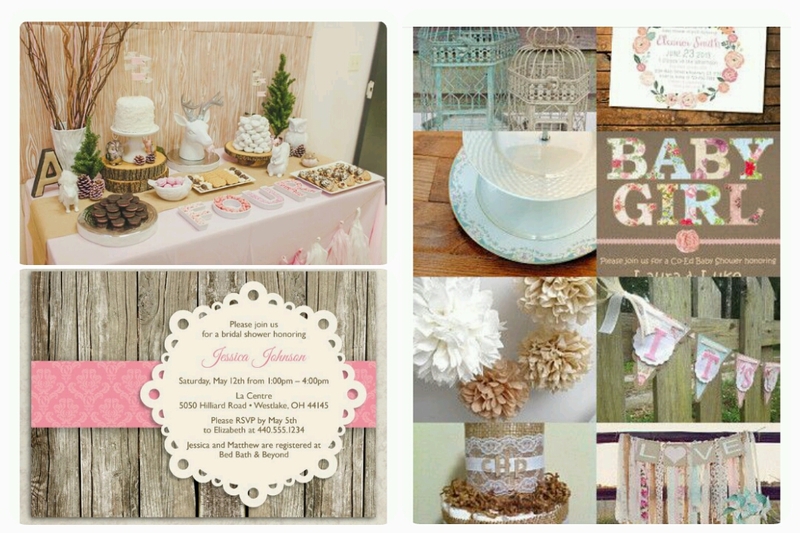 In my opinion, invitations help set the tone for the entire theme and decor of the event. I also think it’s fun to give the mom-to-be (and her Guests), a little taste of what’s to come. I had already previously decided on the shower’s color scheme: pink, grey and white; these are the same colors being used in the Baby Girl’s nursery and I thought it’d be a nice touch if the Baby Shower continued in that vain. With the color scheme in mind, it was time to start incorporating pieces of the theme into the design of the invitation. I opted for a shabby chic-style floral paper to add a pop of color and a lace-inspired circle that contained all of the event’s information. 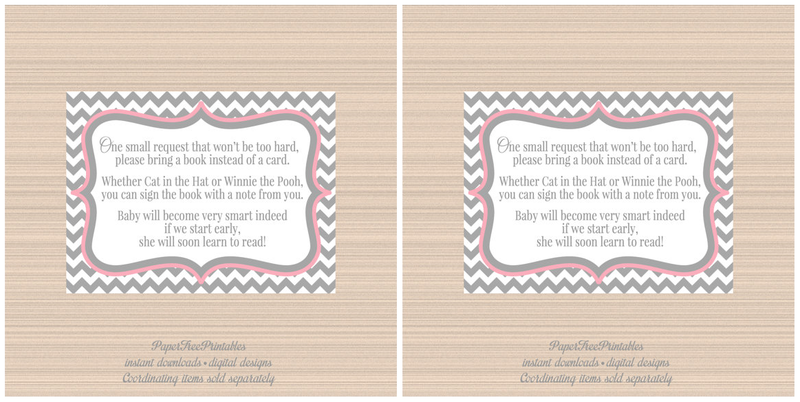 The mom-to-be also wanted to ask Guests to bring a book rather than a card which I think is a really nice touch. Most people tend to throw away cards. So rather than spend money on something that will eventually end up in the trash, why not ask for something that the Baby can enjoy in the coming years? Also. I wanted to make sure that mom was stocked up on diapers, so, I’ll also be asking the Guests to bring a pack of diapers (in any size) for their chance to be entered into the diaper raffle for a prize. The inserts were only $5 a piece and I was able to print really high-quality images using my home printer. With everything put together with glue and some nicer-looking paperclips, here’s the finished product! Notice that the pink, grey and white colors are still visually dominant but there are some nice shabby chic-inspired elements. I also made sure to tie everything together with a pretty cream-colored envelope and personalized address labels that matched the overall Baby Shower theme. I can’t wait to send these out to all of the Guests at the beginning of next month! The invitations ended up being a little bit more time consuming than I had originally anticipated (and I even used my Circut), so I’m glad I gave myself plenty of time to get them all done! I am honored to have been recognized for my new blog by the creative and talented, Broody-Moody Mind of Broadcast from a Broody-Moody Mind. She has an un-filtered and unique perspective that is a joy to read. 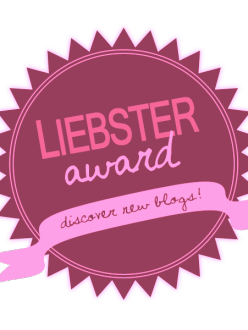 The Liebster Award was created to recognize and/or discover new bloggers and welcome them to the blogosphere. In our digital world, this is a wonderful and inspiring gesture. As someone that has started blogs in the past and abandoned them quickly, it’s a nice affirmation of my talent, effort and the journey I’m on with this particular blog — a journey that I’m committed to. I’ll be honest, I started planning my friend’s baby shower before we even knew the gender because she had asked me early on. I used Pinterest to get some ideas on what I liked as far as themes, games and activities, and food. Once I knew the gender (it’s a Baby Girl), I quickly came up with the theme and color scheme based on what the momma-to-be and her husband were doing with the nursery so I could make decorations that she could easily incorporate if she wanted to. Realistically, very few people start planning a baby shower as early as I did, but, some do. I just like the idea of planning that far in advance to help spread out the cost of the shower and not leave everything to the last minute. However, there is definitely a way to plan and do everything closer to the event’s date. 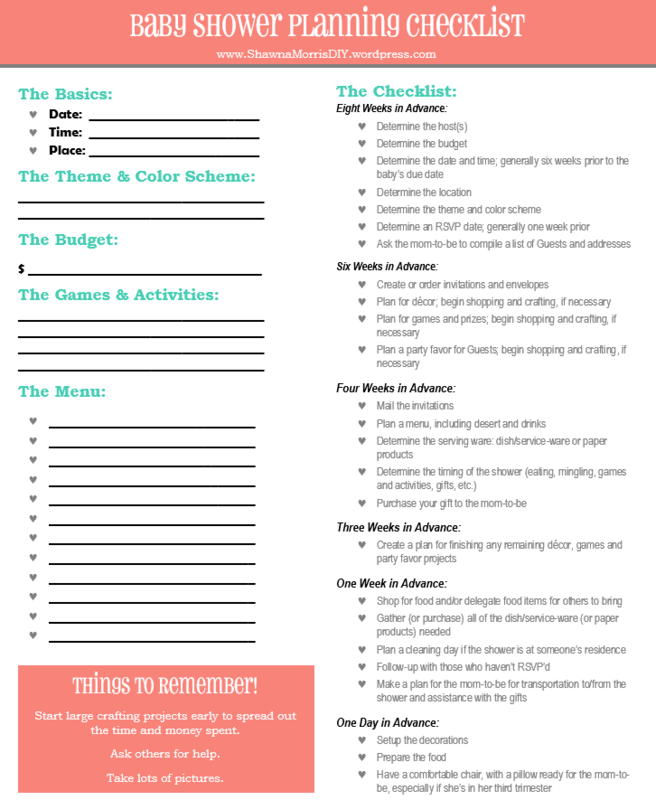 Because I like pictures and things that I can cross off a list, I’ve created the “Ultimate Baby Shower Planning Checklist”. This list is pretty comprehensive and there’s a nice timeline to follow! Enjoy! One of my dearest friends in the whole world is having a baby girl in December! I was extremely honored when she asked if I would throw her baby shower for her in November. Since then, I’ve been pinning, planning and creating for months! I wanted to document my whole journey. Not just the baby shower, but all of my crafting adventures and projects. Why not combine my love of crafts and DIY projects with my love of writing? A perfect pairing, I think! Now. The inspiration for the Baby Shower! The momma-to-be and I are very much alike when it comes to our styles, so I opted for a blend of “shabby chic” and “woodland”. There’s a lot of pink, gray and white with touches of burlap, lace, wood and even a little metal. Throughout the baby shower planning process, I’ll post other inspiration pieces, final projects and quite possibly, some tutorials! Thank you for reading and check back soon (and often) for some awesome crafty, DIY projects!